40 Ten Motives Regular cartilages. Condition is New. Dispatched with Royal Mail 1st Class. Honeyrose Legacy is manufactured using specially selected and naturally grown herbs including marshmallow leaf, wild lettuce, rose petals and red clover with honey and apple juice. Legacy has the addition of a specially developed chocolate flavour. A pouch contains 30g of smoking mix. Honeyrose herbal products are 100% natural and guaranteed to be Nicotine and Tobacco FREE. nicorette quickmist cool berry Good Dates 03/2020 . Condition is New. Dispatched with Royal Mail 2nd Class. Vype eTank Pro Kit. Condition is New. Greengo Products - (Smoking Mix). - Greengo is a unique herbal blend. Made for smokers who want to smoke, but without the nicotine. It's a unique blend. Use: Nicorette® QuickMist Cool Berry is used to relieve and/or prevent withdrawal symptoms and reduce the cravings you get when you try to stop smoking or when cutting down the number of cigarettes you smoke. REALLEAF Organic Herbal Smoking Mixture 100% Nicotine & Tobacco Free ! RealLeaf is a unique herbal blend. Made for smokers who want to smoke, but don't want to get polluted with nicotine. RealLeaf is made of rich mixture of organic marshmallow, mullein and red raspberry leave provides a different smoking experience brimming with delicate aroma and smooth taste. Get a pleasure of herbal smoking - no paper to burn. - real rejuvenator. 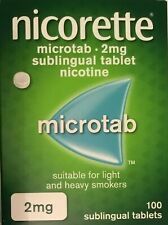 Nicorette Original Flavour Sugar-Free Gum 4mg Nicotine 210 Pieces Long Expiry. Condition is New. Dispatched with Royal Mail 2nd Class. Nicorette gum relieves and/or prevents withdrawal symptoms including cravings experienced when trying to stop smoking or cutting down on cigarettes. It provides a safer alternative to smoking for both the individual and those around them. Tarlock cigarette tar filters contain no chemicals but work using centrifugal force. This brown sludge is clearly visible right from the first cigarette you smoke. Tarlock cigarette tar filters are made from food quality plastic, and have no taste. NICORETTE STEP 1 PATCHES 25mg 4 packets of 7. 15mg 1 pack of 7. Condition is New . Dispatched with Royal Mail 1st Class. Lyft Slim Nicotine Pouches 6mg Polar mint. Condition is New. Dispatched with Royal Mail 1st Class. GALPHARM LOZENGES. 4mg Lozenges nicotine. 2 BOX OF 36 LOZENGES. SMALL FUNNEL. Funnel tip – 5mm approx. Small finger grip. Quantity: 1. Condition: New. Nicorette Quickmist Mouthspray Cool Berry Spray. Condition is New. Dispatched with Royal Mail 2nd Class.